There are a lot of things cyclists have to worry about in a race that you’d never imagine as a spectator. The shape their bike is in, if they trained hard enough, whether they have efficient energy, how close they’re riding to the bike in front of them, to name a few. COLLECTING CRAMPS — Riders in the annual LOTOJA bicycle race hit the road. 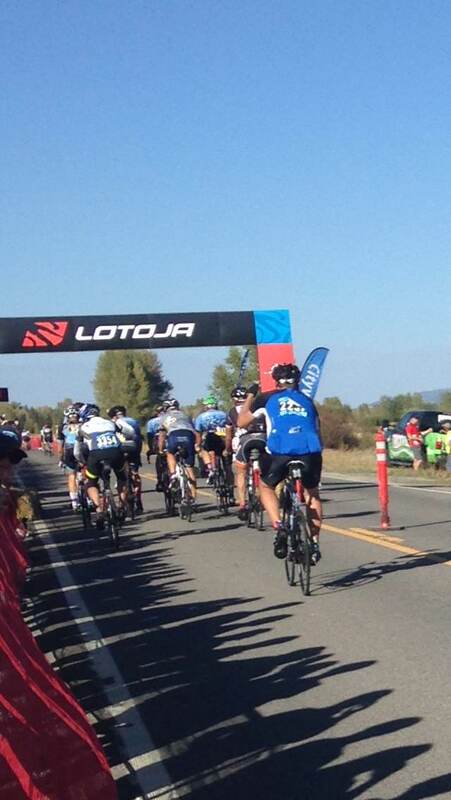 The 200+ mile bike ride from Logan to Jackson – or LOTOJA in shorthand – took place this past weekend. And according to the race director, Brent Chambers, safety is the number one priority for everyone involved. Chambers said they have a route for the cyclists, and a route for the support vehicles. Vehicles are not allowed to travel on the same road as the bikers — with the exception of Hwy. 91 — until they get in to Star Valley. Young is thankful that they get the road to themselves the majority of the race. He recently had an incident while training for LOTOJA where a car pulled out in front of him and as he tried to avoid hitting the car he laid down his bike and slid next to the car. Young only suffered a few scrapes and bruises from the crash, but he admitted he gets nervous whenever he thinks about getting on his bike. Accidents are just a part of bike racing, said Chambers. The most common injury he sees is road rash, and clavicle breaks. Usually when a biker goes down it’s because he or she got too close to the racer in front of them and touched their wheel, which then throws them off balance. He does remember a time a few years ago in Afton where a biker ran a stop sign, t-boned a car and broke his hip. And not to mention the time another cyclist t-boned a deer. “That was an interesting accident,” said Chambers. In 2012, there was even a fatality when a rider hit a pothole on a bridge north of Hoback Junction in Wyoming and went over the side of the bridge. AFTER THE RACE, cyclist Kyle Morris works cramps out of his legs. Chambers said his biggest stressor before race day are the things he can’t control, like these bike accidents. He said he can put in time year round to make the race as safe as possible, but he still can’t control certain variables. Some racers may not train as hard as they should, and find their bodies can’t quite make it without a lot of pain. First-time racer Kyle Morris said if he did it again he’d train a lot harder. He said the last six miles consisted of fighting cramping in both legs. After the race he proceeded to the nearest stream to ice his tired muscles. To help assist and prevent any harm that could come upon the racers there are 200 volunteers on the course to help in a number of ways. There are volunteers that are stationary, and volunteers that are mobile which they call “neutral support.” These people are in vehicles that follow the race route. There are also motorcycle marshals to help ensure the cyclists have safe passage, are following the rules of the road, and race guidelines.